There have been many exciting AWA® program activities since our last update, so here’s an overview on what’s been happening to boost our presence in key Asia markets! The Australian Seafood CRC closed on 30th June 2015, the Seafood CRC Company Limited has however remained open to assist industry with market development & trade activities and to assist industry sectors wishing to implement marketing levies. The AWA® Program activities have been able to continue since the closing of the CRC with thanks to the voluntary contribution from the Tasmanian Abalone Industry. The AWA® Program team would like to acknowledge and thank the Tasmanian Abalone Council for their contribution which is helping to fund the many of the recent AWA® events and activities. Thanks also to the AWA® exporters who continue to support the program with significant direct investment in these events. Asian consumers are hooked on their digital devices so any business serious about promoting their product in Asian markets need to establish a “digital” presence. 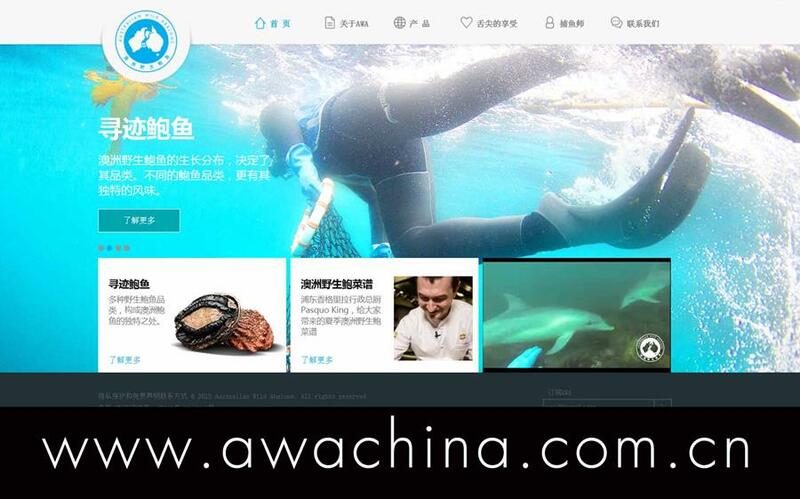 The AWA® program, with the assistance of the Australian Seafood CRC and FRDC have developed and launched a Chinese optimised website www.awachina.com.cn to promote Australian Wild Abalone® and reach our Chinese audience. The site, still in beta version, is a key educational tool to support the B2B and B2C communications. It has been designed specifically for the Chinese Food & Beverage sector and, based on feedback, further updates will be made. When the site has been fully tested and finalised it will be optimised on Baidu (www.baidu.com) – the Chinese equivalent to the Google Search engine- so that AWA® appears high in the search results. The AWA® project team are working on a social media strategy to leverage our promotional activities, including our “AWA® Innovative Cuisine Design Competition” which we are conducting in partnership with the China Cuisine Association. China based digital media agencies have been contracted to manage the www.awachina.com.cn website and our social media pages so we can respond quickly to enquiries and provide real-time updates of our activities! Please take a look at our new AWAChina website www.awachina.com.cn, and contact us with your comments - we welcome your feedback! AWA® Diver Cam launched in Shanghai! 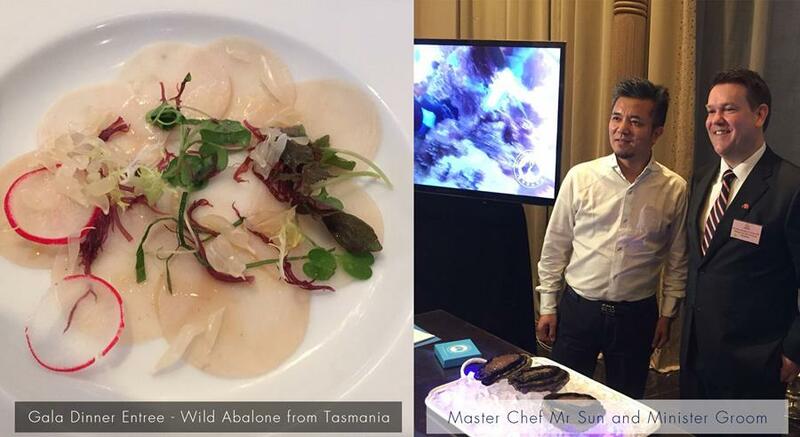 Australian Wild Abalone's presence took centre stage at the Savour Tasmania event, held in Shanghai earlier this month. This event ensured Australian Wild Abalone® left a dominating footprint as part of a Tasmanian goverment delegation to promote Tasmanian produce to the Chinese, and provided an ideal platform to launch our Diver Cam experience, hosted on the new AWAChina.com.cn website! We showcased Australian Wild Abalone® in an interactive display & wild abalone harvested from Tasmania was featured in a spectacular entree dish (thanks to Ralph's Tasmanian Seafood). Australian Wild Abalone® made an impact on stage at the Gala Dinner, where Dean Lisson and celebrity Chinese chef "Mr Sun" launched our new Chinese website featuring 'DIVER CAM', and announced the exciting Australian Wild Abalone® chef's competition in collaboration with the China Cuisine Association. The event resulted in Australian Wild Abalone® being front of mind for every Chinese VIP guest in the house and ensured our special and premium product was featured in a number of prominent Chinese media articles. Events like Savour Tasmania are important to keep up awareness of Australian Wild Abalone® and how it tastes when compared to our competitors! The contacts we gained from the event will also help with our future promotion activities. 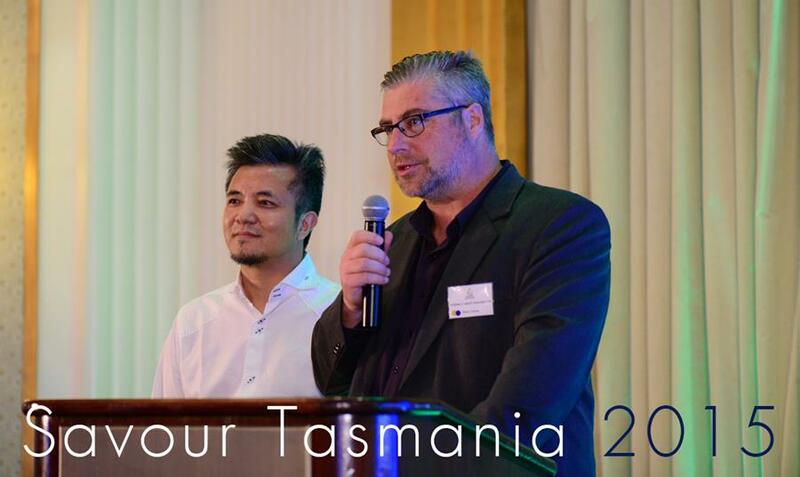 Savour Tasmania 2015, held at the Peninsula Hotel on the Bund in Shanghai, was the centerpiece of the Tasmanian Government Asia Trade Mission from 4th to 11th of September 2015. The event was attended by Tasmanian Premier & Tourism Minister Will Hodgman, and Minister Groom – Tasmanian Minister for State Growth, Energy, Environment & Parks and Heritage, amongst other prestigious guests. The Savour Tasmania gala dinner hosted 300 in-market influencers in the food and beverage, tourism and investment sectors, it featured a range of Tasmanian fine food and beverages including Australian Wild Abalone® from Tasmania, Tasmanian salmon and beef along with Tasmanian pinot, sparkling wine and whisky. We will keep you posted on any updates from Chinese and Australian media coverage from the event, and have uploaded some photos from the evening onto our Australian Wild Abalone® facebook page. For the most up to date news from Australian Wild Abalone®, please subscribe to our newsletter, link in to our facebook page or tweet with us on twitter - @AbaloneAWA!